Strangely enough, no actual war. When we last left our titular hero, Scot Harvath, he was doing super-awesome bad-guy killing for America! Now, he’s ready for covert action, called upon to engage in unsanctioned international kidnapping and torture (for America!) so that he can help stop the next great war. In Act of War, the intelligence community is convinced that China is on the verge of collapse and eyeing the takeover of the United States as their salvation. The catch? They are not 100% sure it’s true. The reason? The word on the intel street is that terrorist attacks in the U.S. are imminent, not military attacks from China. But could China ultimately be behind the attacks? Following several leads, black ops are launched into North Korea and the Middle East, with Harvath at the helm. 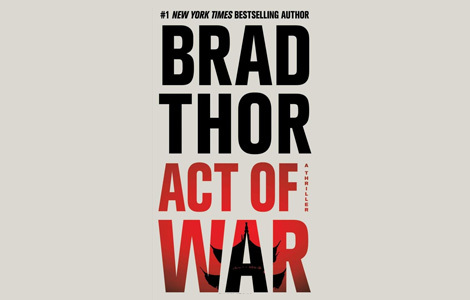 If you’re familiar with the Scot Harvath line of novels by Brad Thor, nothing here will sway your opinion of the series. I’ve read two other novels in this line and enjoyed them both. The author writes excellent action thrillers that are well-paced, suspenseful, and often topical. There is a political bent, though. Readers can expect to get injected with 300cc’s of anti-liberal-snowflake patriotism once or twice, so start tapping those veins. I get angry about the state of the world now and again, too, but life is more complicated than this kind of novel wants you to believe. But, you know, maybe that’s how the author vents his frustrations, with these flights of fantasy. I don’t blame him. We all want to be the ultimate hero, and the ultimate hero in an action novel is rarely the diplomatic attaché. Anyway, this story is a bit different from the others I have read in terms of structure. There is significant time divided between our hero traipsing around the world and a group of Seals infiltrating North Korea. While I expected these two threads to intertwine, they really didn’t, at least not enough to justify the diversion. And, to be honest, I found the North Korea thread more compelling for a large portion of the novel. There was a constant level of suspense surrounding the incursion. On the other hand, once events start moving faster in America, the Harvath thread starts to catch up. There is an interesting look at how various law enforcement and intelligence services try to work together to draw the big picture and find the bad guys. It’s probably a little too neat (I would expect a little more need-to-know getting in the way), but it layers on some realism that helps add depth to the story. At the end of it all, though, I felt that the whole book was anticlimactic. Scot Harvath isn’t exactly the hero, but more of a role-player; the two separate story lines don’t have enough impact on each other; and the narrative doesn’t build up in a compelling way compared to previous novels. Perhaps a more textured look at intelligence games between China and the U.S., rather than a black-and-white action blockbuster? Or maybe if Harvath made some mistakes along the way to ratchet up the tension? I don’t know the answer. I just know that this story was interesting, but ultimately missing something.